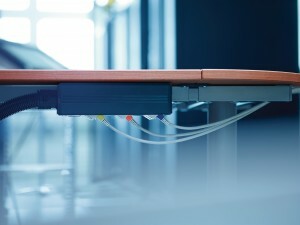 The Grid Outlet Position (GOP) Box is a new development by R&M for the fast connection of workstations and similar applications. Structured cabling is thus available in record time. How to cable a workplace or conference table in a flash: Attach the base plate of the GOP Box with four screws. Click in the housing on top. And you have six ports for PCs, IP telephones, projectors, monitors, network drives and lots more at your disposal. Powerful cables and RJ45 connection modules or fiber-optic connections are already integrated and fulfill the standards for structured cabling. Because ideally, the GOP Box is ordered completely pre-terminated and factory-tested. GOP stands for Grid Outlet Position. In particular, it was developed for grid concepts in raised-floor environments. The solution for the modern LAN and office cabling and comparable applications facilitates installation. It reduces the provision of workstation infrastructure to just a few easy steps. The compact outlet made of fiberglass-reinforced polycarbonate is flexible and can be assembled on tables, ceilings or walls, in furniture, raised floors or conduits. It can be mounted directly or in combination with a base plate or screen. R&M supplies the connected flexible hose and the integrated, pre-terminated cables in a customized form. The cables are routed to a consolidation point in the raised floor or floor distributor, and then simply plugged in. The GOP Box can be color-coded. It also offers spacious label fields. Please read more information in the R&M GOP Box brochure.